The Basket of Memories honors rich remembrances of one dearly missed with a vivid mix of blooms that offer strength and comfort alike during a time of sorrow. 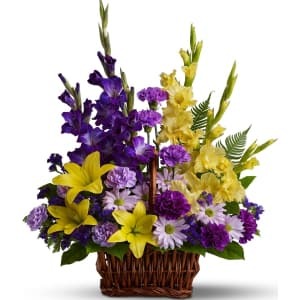 • Beautiful fresh flowers such as yellow asiatic lilies and gladioli contrast with purple carnations, statice and gladioli, plus lavender carnations and chrysanthemums in a rectangular basket with handle. 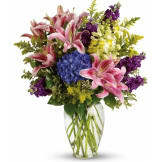 • Arrangement measures approximately 21" W X 28" H.
Flowers will be received by a Wiecki-Skipchak Funeral Home's staff. I was not able to attend the funeral services for a friend but was extremely pleased that I was able to let the family know I share their sorrow through this beautiful basket of flower. I especially appreciate the timely notices that advise of the purchase and delivery of the basket as this helped put my mind at ease. The website was extremely user friendly which made supporting a friend in a very difficult less stressful. The arrangement was beautiful...looked exactly as pictured. A VERY BEAUTIFUL CHOICE FOR THE MONEY! All of our flowers are designed and delivered by hand from a local florist in in Berlin.